You know how you hear these stories of people starting their babies on solid food – “He just loved it!” “Gobbled it right up!” “It’s his favorite!” HAHHHH. I laugh. 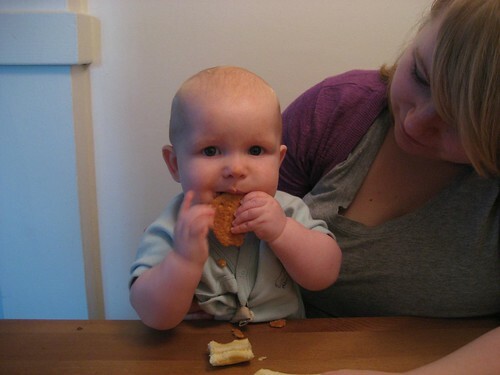 We started by giving him tiny bits of banana to taste and a graham cracker to wave around. He did not enjoy the banana much, but seemed to really like the cracker. Of course, his face broke out in tiny bumps later that day so we haven’t tried the graham cracker again, just in case. We tried sweet potatoes (hates), avocadoes, (REALLY hates) and then resorted to rice cereal, the most bland stuff on the face of the earth. He hated that too. We decided to try one of his mesh feeders with a bit of a pear, and finally! It was a hit! A couple months ago we tried giving him the feeder with nothing in it and he would barely touch it to his mouth – he didn’t seem to like the texture – so I was really surprised he liked it enough to eat all the bits of pear. Today we tried banana, sweet potato, and rice cereal (separately, together, whatever) and he still hates the sweet potato and rice cereal. He seemed to enjoy the banana in the feeder but not by itself. I’m not in any kind of rush to get him to eat solid foods. Daycare pushed me into letting them try rice cereal during the day, even though I told them he hates it, just to get some practice with a spoon. I just want to make sure we try different things so he gets used to the tastes and textures for when he IS ready to eat real food. For the time being, we’re both happy with him just eating milk. What a silly baby. This made me smile as he is wearing a bib I got him and possibly using the mesh feeder from me too. Andrew definitely liked the more bland stuff when he was starting out. Sweet potatoes were a big hit, but he hated bananas and all the sweeter stuff that most normal babies seem to like from the start. Thankfully he got over that and will eat pretty much anything now, especially if it’s what we’re eating. He’s gotten so used to feeding himself table food that he hates using a spoon anymore. We’re definitely moving backwards! Just like with the lack of sleep! If it helps, I know of a 13-14mo old who survives almost exclusively on BM and he’s huge. He’s not a big foodie either. 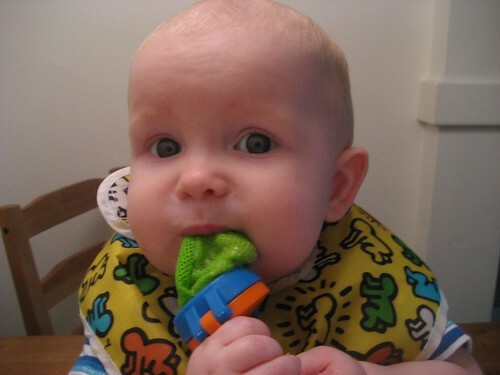 It does help – I’m still not sure how long babies can go before they “need” solid food. When I asked our pediatrician, he said 7-8 months, but I really don’t think that’s true at all – I thought it was more like 14-18 months. (Though, he may have just been saying that w/r/t introducing food, not that he couldn’t still basically be exclusively breastfed. Not sure.) It made me a little worried that my commitment to BFing will make him malnourished, but he seems to be thriving.